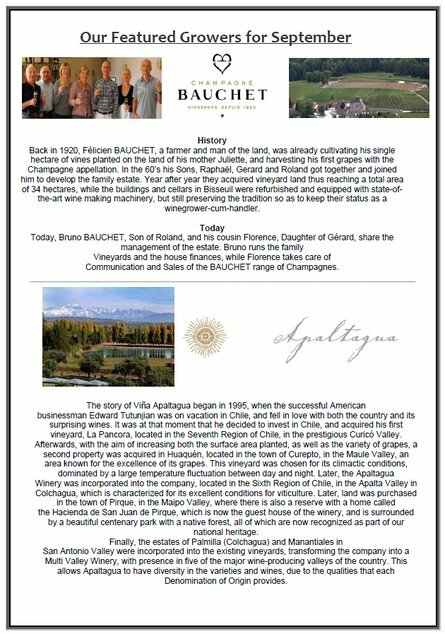 A fantastic round of October tastings was opened by Florence Bauchet of Champagne Bauchet presenting her three cuvées (Brut, Signature and Rosé) produced with her cousin and winemaker Bruno Bauchet in Bisseuil. Winemaker Pablo Barro of Apaltagua then presented wines principally from his vineyards in the San Antonio and Curico Valley regions of Chile. We completed the selection with a preview of an modern, upcoming New Zealand winery Misty Cove, and finished with a fine selection of sweet wines from Coteaux Du Layon of the Loire Valley. As usual our Autumn tastings were held in Oxford (Brasserie Blanc, Wednesday 5th October), Cambridge (Restaurant Alimentum, Thursday 6th October), and London (Fish Restaurant, Borough Market, Friday 7th October). Invitations to our tastings are emailed to customers by the sales team 2-4 weeks in advance, and we rotate venues to give all customers a chance to attend. Please speak with sales@abfw.co.uk to open a trade account for your business.